An infantry battalion with a major role in the 2010 assault on Marjah, Afghanistan, has returned to the war-torn district. First Battalion, 6th Marines, out of Camp Lejeune, N.C., is taking over this month for 2nd Battalion, 8th Marines, also out of Lejeune. It isn’t new ground for 1/6, which patroled central Marjah from the February assault through June last year, when the district was regularly marred by violence. Marines with 1/6 will be joined for the next few months in Marjah by 3rd Battalion, 6th Marines. It’s an arrangement with many similarities to spring 2010, when 3/6 patrolled the northern half of the district and 1/6 manned the center. Marines with 2/8, meanwhile, will return to Lejeune soon. 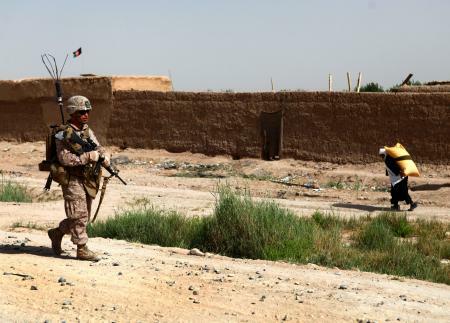 They’ve had a rough deployment, particularly those in Echo Company 2/8, which deployed to northern Helmand to patrol battlespace in the violent Sangin area near 1st Battalion, 5th Marines, out of Camp Pendleton, Calif. It wasn’t immediately clear whether a company of 1/6 or 3/6 Marines has deployed to the Sangin area to assist in Sangin. While we’re on the subject of deployments, it’s also worth noting that Lejeune’s 1st Battalion, 9th Marines, also is now settled in central Helmand, including in Nawa district. They replaced 2nd Battalion, 3rd Marines, out of Marine Corps Base Hawaii, which returned home in June. I am so proud of you guys..just say safe and make it home in one piece..i love u Cpl Anderson..i miss you like crazy! Welcome home 2/8. Job well done. Be safe my son, we’re praying for you and your guys everyday! Praying for healing for Echo and the rest of the 2/8. They had it pretty ugly from what I’ve read. Our hearts and prayers go out to the Marines and their families of the 2/8 and the 3/5 who have sacrificed so much in Sangin. Take care of business 1/6 and come home safe to us. We love and miss you Cpl. KCW c u soon! These guys have our backing 100%. Praying that they are protected by God Himself and that all will return home, safely. Marines (and other branches), you are loved. Be safe. Good point. As I’m sure you’ve seen, I’ve blogged about 3/6’s return to Afghanistan before. I was trying to point out here that they’ll operate nearby 1/6 again for the next several months, in light of them being downrange for a while already. May our God provide Hedges of Protection, The Shield of David, and the weapons of the Angels for each and every Marine over there. I also have a loved one over there. May God Bless them all and confuse the enemy to the poin that they will not want to use IED’s and such. May the Lord surround and protect our men as they sacrifice for all of us. We must pray for wisdom for our leaders in knowing when this war is to end. My Son is in Bravo 1/6 and has been in Sangin since his deployment. They also have had rough time since getting there. He is still in good spirits as expected from a MARINE. As a Veteran i fully support and understand what they are going through and my hearts goes out to all that serve. Do any of you know how or where to look to see if my brother is ok? My mom tells me things (at least she thinks does) but I would rather get it myself so if she forgets I can still be in the loop. God bless and protect my Brother and all of our family members. I know the feelings I get just waiting to hear somthing (hopefully good) and it drives me nuts. I was let go from the army almost 10 yrs ago due to crappy health and my heart yearns to be my friends and my kid brother.I AM SO DANG PROUD OF HIM NO MATTER WHAT BRANCH HE IS IN. I just hate it that I cant do anything from here. do any of you know where family members can talk to other family members about how they feel?